Ask Ed is designed to begin a dialogue between children and parents, children and teachers or may be used independently by a child. Its purpose is to help children identify and discuss problems, rate the seriousness of the problem, share their feelings and decide on a plan of action. Every day we can be confronted with problems – small, easy to handle issues through to more complex, demanding problems. By taking ownership of a problem and taking time to think about and decide on possible solutions we gain a measure of control and a plan for moving forward. 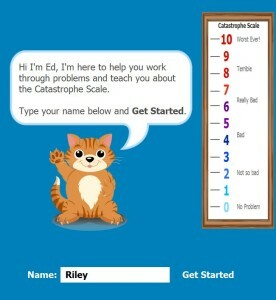 Ask Ed uses the Catastrophe Scale to help children put their problems in perspective. It deals with both small problems and serious issues. You can download an A4 poster of the Catastrophe Scale in PDF format here. Ask Ed can be used at school, at home or out and about with individual children or groups of children. Ask Ed can be used to deal with any ‘real life’ problems, from the smallest issue to a full blown catastrophe! Ask Ed for Android Released! Did you know that Ask Ed provides a ‘special report’? Ask Ed helps children, parents and teachers work together to tackle social, emotional and behavioural problems. It provides an easy and practical approach to help children voice their problems, express their feelings and decide on a plan of action. Ask Ed is available for download now on iOS or Android. We'd love to hear about how you have used the Ask Ed app.